Homeowners often spend several thousand dollars on the interior of their homes. They buy luxurious sofas, exquisite lighting fixtures and spend money on buying original paintings. Sadly, they forget the exterior of their homes and that is where they go wrong. If you want to create a long-lasting first impression, you need to increase the beauty of the exterior of your home. And, what is the simplest way of achieving your goal? 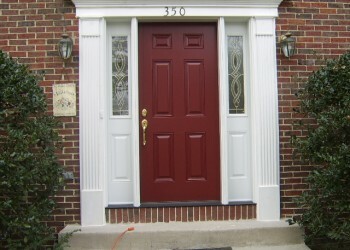 A great exterior home painting job can help you to add to the curb appeal of your home. It will enable you to increase the property’s value without undertaking costly renovation projects such as changing the landscape, adding a swimming pool or building a patio. What Things to consider before beginning an Exterior Home Painting Job? If you are painting a bathroom wall or a kitchen cabinet, you do not have to worry about the weather. But, as you will be undertaking an exterior home painting job, it is important to take the weather into consideration. Why? It is because paint reacts to temperature and moisture quickly. And, if you paint in an unfavorable weather, you will not get the desired results. Remember that a mild weather will provide you with long-lasting results. The ideal season for beginning a painting job is spring and summer. And, the best temperature to start your work is at least 50°F. In 1978, lead-based paints were banned in Canada. So, if your house before was built before lead was banned, the paint may contain lead. It means you have to be extra careful when removing the layers of paint. It is best to use a respirator and a grinding machine to protect your health. Start with a clean slate. It is essential for obtaining the most durable painting results. If the painting surface is clean, it will be able to hold the paint in an excellent way. You can opt for pressure washing and clean the exterior of your home with water. It will aid you in avoiding harmful chemicals used for cleaning. A great exterior home painting job requires perfect planning. And, before you begin the job, it is necessary that you plan to repair the cracks in the structure of your home. Check each and every painting surface for cracks. If you find cracks in the foundation of your home, contact a foundation repair contractor to repair it. Also, pay attention to holes in deck, patio, etc. and take care of them. A painting job is not restricted to applying paint on the walls. It involves caulking the doors and windows in order to waterproof the home as well as restrict the heat loss. So, do not forget to seal cracks and gaps between the walls and the doors/windows. Applying the primer to the painting surface may seem like a waste of time and money, but it is not true. It is a crucial element when painting the exterior of your home. It is because the exterior surface of any property is not very smooth. It can absorb a large amount of paint and provide uneven results. But, if you apply the primer, it will create a good painting surface and ensure an even appearance. The market offers a vast range of paints. But, you should know which ones to buy for your job. Make a choice after thorough consideration because paints designed for interior walls do not do well with the exterior surface of the property. It is important to choose quality paints. If you opt for cheap quality products, you will not be able to protect your home from harsh weather and pests. Do not leave the local home improvement store without buying a couple of quality brushes for painting the windows and doors. If you have to paint wide surfaces, pick up rollers and sprayers for even results. Top-quality tools result in a consistent and long-lasting finish. Also, it will speed up the painting process and simplify your job. In order to create a long-lasting first impression, a great exterior home painting job is required. Keep the eight painting tips in mind to keep your project on track. It will ensure minimal wastage of paint and reduce your expenditure as well. Want to improve the look of your home? Trust Perfect Painters for a great exterior home painting job. Get in touch with the reputed home painters of Toronto and get ready for stunning painting results.